We initially became Owners to force us to have holidays each year. It has been so successful at doing that, we are now addicted to holidaying at our WorldMarkSP Resorts. Over the last seven years we have been to Caloundra, Kirra Beach, Noosaville, Tree tops Coffs Harbour, Flynns Beach Port Macquarie, Seven Mile Beach Tasmania, Dunsborough Western Australia, Rotorua New Zealand and this year Denarau Island Fiji. They have all been fantastic holidays. In May this year we travelled to Fiji. We arrived in Nadi airport at 7pm and were soon through the customs queue. The line of taxis was very long and very diverse, anything from old 1980s Nissan Bluebirds to new Toyota Taragos. We were hustled to the taxi at the front, which was very old, and began our transfer to Denarau Island and Wyndham Resort. Tip for travellers, check out the taxis, pick the one you would like to travel in and negotiate before you get in. When we arrived at the resort we were greeted with a friendly “Bula”, a cool refreshing towel and some musicians playing welcoming songs for our enjoyment. We were shown to our room where we found a welcome dish of local fruit and a bottle of sparkling wine waiting for us. The view from our room was just as we had imagined, palm trees and blue water. The following morning Zenny came to welcome us to the resort. She presented us with a welcome pack of local body products and went through the facilities of the resort and some of the local attractions. In the afternoon we took a look around the resort. The main swimming pool was closed for refurbishment, which we had been told about when we booked, but the new more initmate pool was a pleasant oasis. We spent many hours of our week at the pool making use of the swim up bar and the daily cocktail specials. Monday night is owners drinks night. A very special evening with drinks, entertainment and competitions provided. Everyone had a great time. A gathering not to be missed. Tuesday night was Lovo dinner at Mamacita’s Mexican Restaurant. 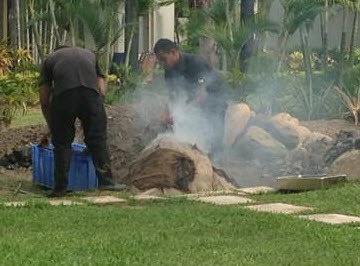 You could see the staff preparing the pit for the fire from early in the day. The food went in around lunchtime and was covered with palm leaves, bags and dirt. The smell during the afternoon was very tempting and by the time dinner came around we were really looking forward to our Fijian meal experience. The meal did not disappoint. The food melted in your mouth and was a taste of Fiji. Friday saw us heading out on a tour organised by Rosie’s Tours, which is very conveniently located in the foyer of Wyndham Resort. The tour took us to a Hindo temple, then to Nadi town where we could purchase some souvenirs, and on to the fruit and vege markets, where the tour guide showed us a Kava ceremony. The next stop was the orchid gardens, a tranquil haven of peace and beauty. There were so many beautiful orchids I couldn’t stop taking photos and the soothing walk through the gardens was fabulous. Then, on to the mud pools and hot springs in the valley of the sleeping giant. Our week at Denarau Island was followed by a 7 night cruise on the Captain Cook Reef Endeavour, which was organised for us through Wyndham travel. That was a fabulous week of snorkeling on the coral reefs, visits to island villages and schools, and food, food, food with some drinks thrown in. I would recommend an island cruise with Captain Cook Cruises to anyone visiting Fiji. It was an exceptional way to relax and be pampered.